Welcome to Day 18! Today's theme is Animal Print, something I am very accustomed to doing. I really love leopard print nails. Whenever I've done them, they've been crazy and neon. My first leopard mani was way back when on Ryan's blog as a guest post. They were so short and nubbed, and had literally no clean up. Look how far I have come. After my nail injury, on my lil nubs I did a neon yellow base with leopard print. Shortly after, I did leopard french tips on more neon polish. Then finally, as my last neon hurrah of the summer, I did neon leopard skittles. All were great, all were funky, but none were classic. For this challenge day, I originally was going to do giraffe nails, but when I sat down to paint, it was late and I didn't want to attempt something new. I fell back on my classic leopard since it is something simple for me. Since my stash has grown since I started blogging, I realized I had the colors to do an actual leopard colored leopard print. This manicure turned out to be one of my favorites of all time. Pretty, right? I really, really, really loved this manicure, but took it off super fast to do my candy manicure for the OPI contest (yeah that's right, this manicure was pre-swatched way before Halloween, I'm a challenge cheater). Kind of sad that I did that because this manicure was just amazing. I'm going to have to do it again once this contest is over. I think I liked it so much because of how I accented this nail with I'm Not Lion. I originally purchased this polish back in August, and did a very simple manicure with it because the glitter is so pretty. For those of you who do not know what this polish is, it's a very light gold, small flecked glitter polish with some holographic flecks as well. In the sun, it's just gorgeous. Literally, you need to find this polish if you don't have it! To do the leopard nails, I took Sinful Colors Nirvana and with my dotting tool placed uneven dots randomly on the nail. When that was dried, with a tooth pick, I outlined the dots unevenly with Sinful Colors Black on Black. I always make sure that the lines of the outline do not meet, meaning that it is not a full black polish circle. I typically do one full side, then the other full side leaving a tiny section open. On the open tan spots on the nail, I added some black dots with my toothpick. Painted on a top coat, and called it a day. What do you think? 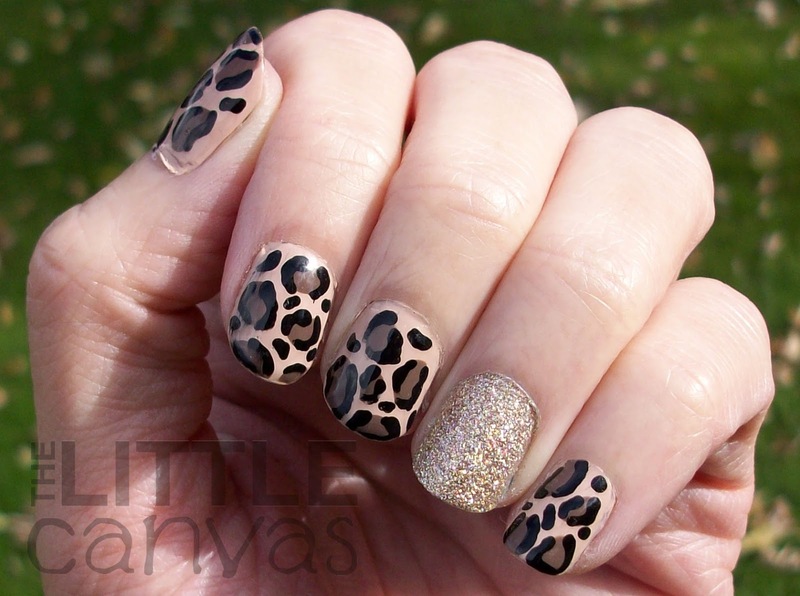 Do you like the classic leopard manicure? Love the accent nail? Think I should have done it or did a full leopard mani? Don't forget to check out the other lovely ladies manicures! UGHHHHH! Love! The accent nail is stellar. You are doing so well with this challenge. I have really enjoyed seeing your talents grow. Looking forward to tribal print! Thank you!!! <3 <3 Isn't the accent great? I love that polish. And thank you girl! 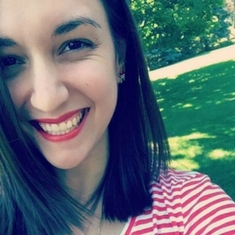 I really miss you in the blogging world, I hope you come back soon, and maybe do a challenge together?? And tribal print is currently on my nails, i did ikats (hehe spoiler alert). i loved the accent nail, i've done animal prints using a toothpick, but stamping it is waaay easier. BTW, i'm losing track with the challenge, Cynthia posted floral inspiration, you're doing the challenge with her right? Thank you so much!!!! Have you tried free hand? It really isn't as bad as it seems! i swear!!! Oh i'm sure it looked like a leopard!!!!! I did zebra print a loooong time ago (the lil guy in my blogger pic had zebra). I do them every once and awhile, but none looked as good as that guy. I'll have to try them again soon. They're time consuming compared to the leopard. Lol you didn't see it! It was a mess!! I guess my problem is placing the dots I'm so OCD I don't even know how to place dots randomly haha and I don't know how many is too many and how many aren't enough blah lol! That can be hard! My random dots for the leopard still are placed in a way that makes sense in my head. Typically I do 5 dot per nail i think...then four on my pinkie, then add in lil dots for the blank spots.